After having started this reading challenge almost two years ago, I am only now starting to really feel like I am able to pick diverse, relatively unbiased literature with current information that I will be able to bring into any academic program (that is when I finally choose my field of study and area of specialization in graduate school.) It has taken me this long to get my act together and for me to develop the practice of choosing books. At first, I chose books based on the following qualifications: a good, solid overview (as I would read one book per country); non-fiction and preferably not a guide book; able to be bought on Amazon for less than $10; and less than 250 pages. One of my disappointments with all of the books that I chose about the Middle East was how little of the woman’s voice my selection represented. As I continue with this challenge and make my future selections, I recognize that this voice is a very important one in the international dialogue. However, on a personal note, as a female, when I read the experiences and perspectives of women from other parts of the world (instead of just a man’s re-telling of their stories), it takes my breath away. It reminds me that in an alternate reality, I could have been born that woman – subject to the same social and cultural influences she is faced with every day; we could have shared the same experiences and the same fate. I feel lucky to have been born into the United States, into a family where I want for nothing and where my achievement in education and in a career is not only encouraged, but expected. 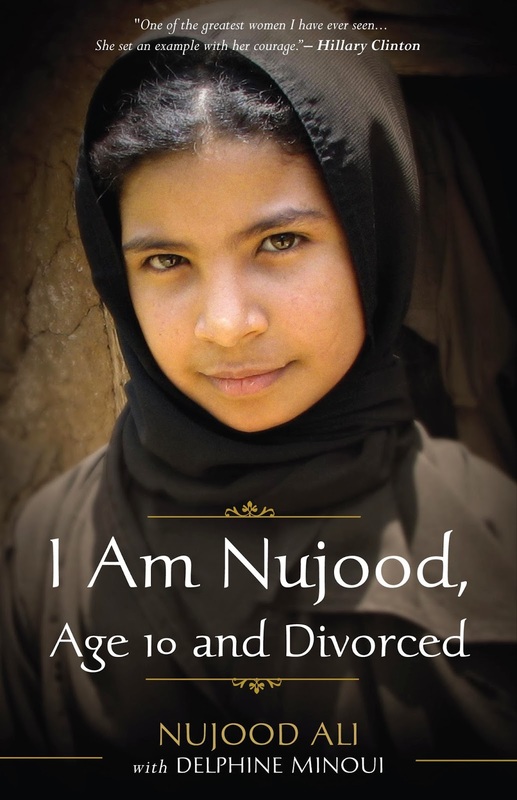 It was with this sentiment that I read Nujood Ali’s memoir, I Am Nujood, Age 10 and Divorced, written with the help of journalist Delphine Minoui. The setting is an incredibly important factor in this book – the country of Yemen. Located on the Arabian Peninsula, Yemen is one of the least developed countries in the world. This is, in part, due to the conflict which has permeated throughout the country’s modern history. Up until 1990, Yemen was actually divided into two separate countries: North and South Yemen (which was socialist and a satellite state of the Soviet Union.) Since then, the country has been plagued by Civil War, secessionist movements, and now the threat of Al Qaeda. I was very inspired by the pluck of young Nujood to do the unthinkable at the age of 10 – all because she realized that it was the right thing for her to do – and would recommend her book to anyone. Even more, I found myself struck by two other factors: (1) The Yemeni Justice System: Nujood went to the courthouse and requested to see a judge. Not only did she get an audience with him, but found herself the recipient of support and encouragement from many in the legal system. In short, the justice system sought to enforce justice and granted Nujood her divorce. After reading so many books about countries where the justice system is corrupt, I found myself pleasantly surprised and even encouraged to read about this case in Yemen. (2) The Lack of Helpful Institutions for Women: Despite winning her divorce, there were no institutions to help Nujood or indeed any young girl who had experienced harm at the hands of her family. In short, she was forced to go back to live at her parents’ house. Although Nujood seemed happy surrounded by her sisters, there is no doubt that there was tension and that there will continue to be tension between her and her father, as well as between her and her brothers.